Attention cat lovers, your movie of the year has arrived. The documentary KEDI takes audiences on an exotic journey to Istanbul, where felines are given free reign of the city. These are not feral cats, keeping their distance from humans and surviving on the fringes. Nor are they pets in the usual sense of the word. Instead, they exist somewhere between those two points, enjoying food and attention from humans while still maintaining a level of independence and staying true to their animal nature. Directed by Ceyda Torun, the film is part travelogue, part nature film, part history lesson, and part study of human nature as it susses out the various reasons why Turks have chosen to co-exist with cats in this way. Sure, the cats get food and love, but the relationship is symbiotic as humans benefit, too. But then, if you're a cat lover, you already knew that. 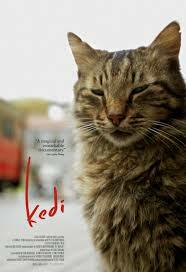 KEDI is beautifully shot and pleasantly engaging. It would be wrong to say that it's especially deep or serious, but it's probably deeper and more serious than most would expect. You could certainly take the kids. Even though the film is in Turkish with subtitles, what does that matter when there are kitties? And for viewers seeking a more intellectual experience, there's considerable food for thought with regard to the human/feline relationship to chew on. 3 out of 4 stars.